Earlier in the week Bill, Dan and I began discussing our options for the weekend. Dan had a Friday off from work and Bill and I were looking forward to a weekend in the high country as it had been months since Bill's last visit to the mountains. 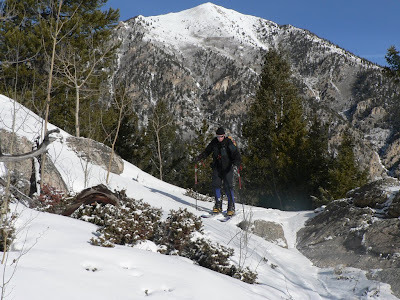 We discussed ideas ranging from an overnight trip to Mount Oklahoma to a climb of the Prow of Kit Carson but ultimately we "whimped" out and opted for the day trip climb of Mount Hope via the Northeast Ridge route. 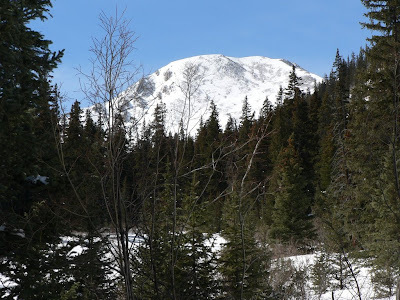 Mount Hope was a high 13er that none of us had climbed previously so we were excited for the climb. It's always a great time when Bill, Dan and I get together for a trip so more than anything I was looking forward to the company! We drove up to the Willis Gulch trailhead near Twin Lakes on Thursday night after work and arrived at the trailhead at 11pm. A "No Camping" sign at the trailhead made us feel a twinge of rebellion as we setup our tents at the all-but-abandoned parking area. 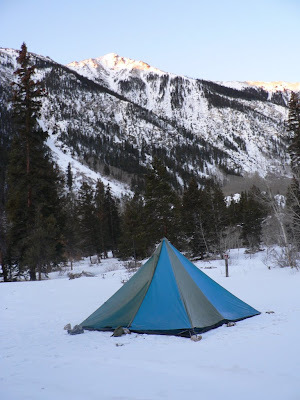 We slept in our tents on snow with underlying ice. The overnight low was around 12 degrees. Bill and I both had set our alarms for 5:10am but we overslept and didn't get up until a little after 6am. An hour later we had our skis/splitboards skinned up and set off just as the sunlight hit the parking area. Our camp at the Willis Gulch trailhead parking area. In what turned out to be a lame move, we opted to head straight across a snow bridge over the river and skip the short jaunt to the nice wooden bridge. Not a great way to start the day. We ended up bushwacking for a bit trying to find the trail and then had to do an ugly bushwack up the hill to reach the original trail. We wasted plenty of time and effort in this initial mistake! 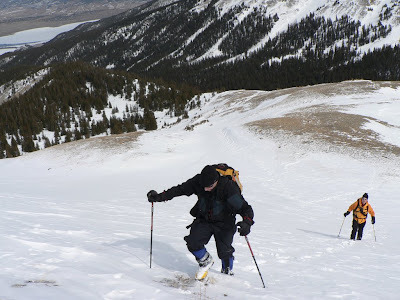 But once we found the good trail, we made good time skinning across the flats towards Twin Lakes and eventually located the pristine-snow-laden Willis Gulch trail. Bill skinning along the trail along the flats towards Willis Gulch. From here it we began breaking trail in 10 inches or so of soft snow. Bill and I took turns in this stuff since we had the nice, wide split snowboards. 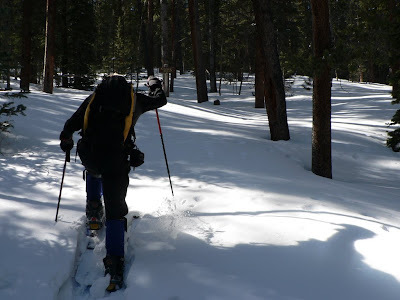 The skinning went great until we reached a section of difficult side-hilling on a crusty layer of snow for about 200 yards. Past that it was more trail breaking to the intersection of the Willis Gulch trail and the Interlaken trail. From here we found snowshoe tracks from someone who had obviously come from the Interlaken trail and enjoyed a nice broken trail for about 1/2 of a mile before the tracks stopped and we were back to trailbreaking in about two feet of snow. The trailbreaking became quite ardous for the rest of the climb to treeline. Again, Bill and I took turns battling it out and had particularly difficult work on the steep switchbacking sections on the northerly aspects. The snow had drifted deep on these aspects and consisted of a soft layer of crust on top of 2+ feet of sugar snow below. The tips of our skis would become submerged underneath and required great effort to extract the skis before making the next step forward. We were moving at a snail's pace! But behind the trailbreaker the going was quite nice! Finally we reached a nice bench area around 11,000 feet and made much better time along this bench to about the 11,200' level. From here we had planned to ascend to the northeast ridge while still being in the trees to minimize our exposure to avalanche danger. 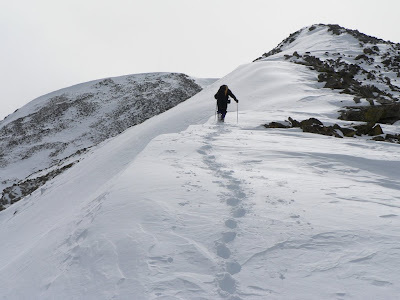 We left the main Willis Gulch trail, crossed a small stream on a mini snow bridge and began switchbacking up steep, wet snow to the ridge proper. The sun had done a good job of stablizing the snowpack here but also made the top layer very wet. This wet layer soaked our climbing skins though. Once we reached the ridge top the colder snow began to stick and cake on to our skins. Each ski instantly became at least 4 pounds heavier and no amont of scraping would keep the snow from sticking again. So we toughed it out with heavy skis. 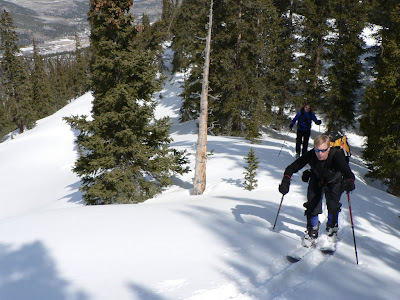 The heavy-ski skinning along the lower NE ridge. It was now a little after 1pm and we had about 2,000 vertical feet remaining to the summit. It had taken us 5 hours to get to that point and we knew we still had at least two hours to go before reaching the summit. We discussed our options and decided that, even though Bill had neglected to bring a headlamp, we'd continue and finish in the dark. Off we went up the ridge. The going was intermittent rock and then snow but the snow was nice and firm for good step-kicking. Bill and Dan on the NE ridge at about 12,300'. We seemed to make great time from 12,000 feet to 13,000 feet but then the wind kicked up and things seemed to slow down for the final 900 feet to the summit. Bill took the lead for this final segement and charged on up kicking nice steps for Dan and I. As we climbed this final section I was in awe with the view around. La Plata Peak and Mount Elbert looked large and looming and off in the distance the other direction I could see Mounts Oxford and Belford next to Missouri Mountain with Mount Harvard showing on the horizon behind them. Bill kicks steps on the upper portion of the climb. Thankfully there were no false summits on this ridge and we arrived at the summit just before 3pm with Bill arriving first and me and Dan arriving about 5 minutes apart after Bill. It had gotten quite breezy so we donned our warm jackets while I made an attempt to dig out the summit register but to no avail. When Dan arrived we took some photos and made a quick turn around since our daylight was limited. On the descent in late-day light. The descending was much faster and we made great time plunge-stepping down the firm snow when we could. We arrived back at the skis around 3:45pm and were stoked to find the skins had dried out completely. This was huge as we knew we'd be able to ski out rather efficiently now. Leaving the skins on the skis to help control our speed (splitboards used as skis don't turn so well!) we followed our tracks back down each taking turns crashing a few times at various locations. 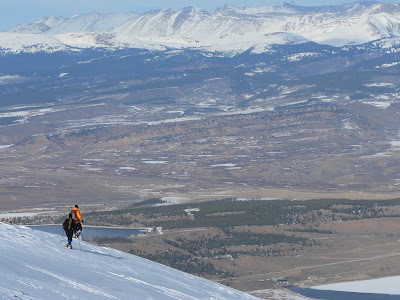 The skiing across the top of the Northeast ridge was pretty good but gettind down off of it on the previously-sunbaked-slope was slow and tedious but we reached the flats at 11,200' by around 4:45pm and took a food/water break. We were feeling the effects of all of the hard work but were still making great time down. Rather than assemble our snowboards, Bill and I opted to continue skiing the nice skin track down behind Dan and were super pleased by how quickly the descent went. Without much trouble we reached the flats down by Twin Lakes at an elevation of 9,350' by 5:40pm! We were confident we'd get back just before it got completely dark. We followed the trail all the way back including the portion of trail we missed in the morning during our "shortcut" and arrived safely back at the vehicle at 6:30pm. We were exhausted by psyched to have pulled off this big day considering how much trail breaking we had to do. A beer at the car, a beer and food at the Coyote Cantina in Johnson Village and a warm night's sleep at camp near Poncha Springs made for a great cap to a great outing. We capped the weekend's adventure off with some always-great friction climbing at Penitente Canyon the following day. Written by Jason Halladay on 10 March 2007 for TheMountainInstitute.com.